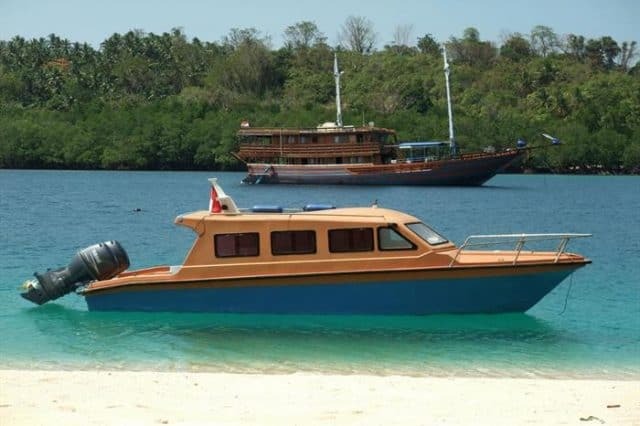 The 30 meters KLM Sunshine is a liveaboard vessel sailing in Indonesia. 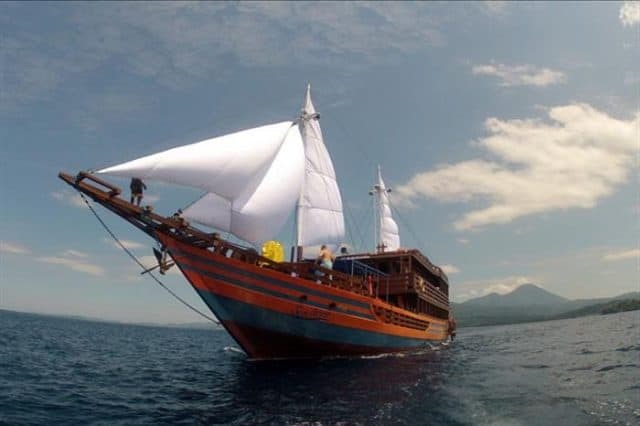 Indeed, the member of the Blue Bay Divers Fleet offers itineraries in North Sulawesi, Halmahera and the Sangihe Islands. The vessel was built in 2011 and refreshed in 2014, upholding the fleet’s great standards. The KLM Sunshine is the perfect boat to have a special feeling of privacy and experience uncrowded scuba diving. 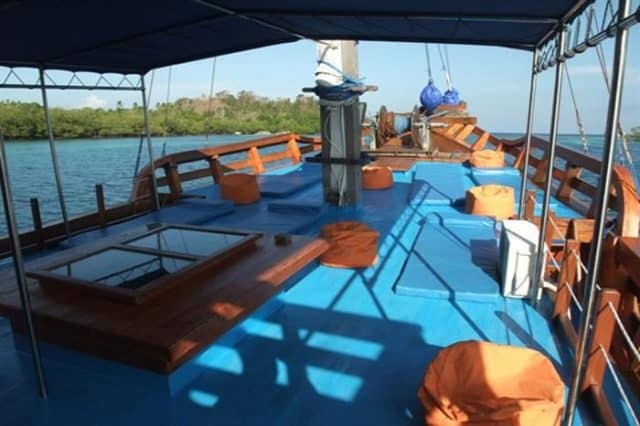 Indeed, the dive vessel welcomes a maximum of 8 divers on-board, in 4 elegantly furnished cabins. The rooms all have air-conditioning, a double-bed as well as an en-suite bathroom. 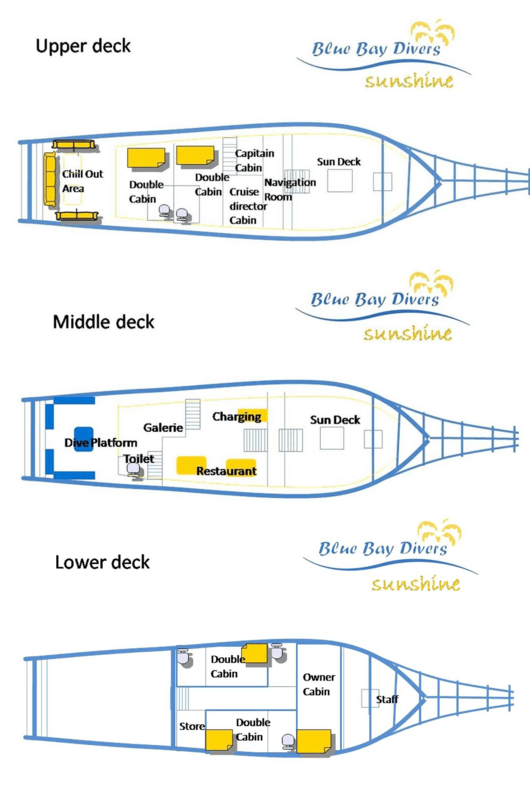 The cabins are located either on the lower deck (2) or the upper deck (2). Catering to only 8 divers, it’s obvious that the 30 meters dive vessel is spacious. Indeed, in all the communal areas, you’ll find that you have more than enough space. The kitchen area is comfortable and welcoming, that’s were freshly cooked meals are served. It’s air-conditioned and also features a camera and laptop charging station. Plus, you can use the big screen television to see and work on your pictures. Furthermore, the front of the vessel is home to a huge, partially covered, sundeck. Indeed, that’s where you’ll find a cozy seating space with bean bags and a sunbathing area with comfortable mats. 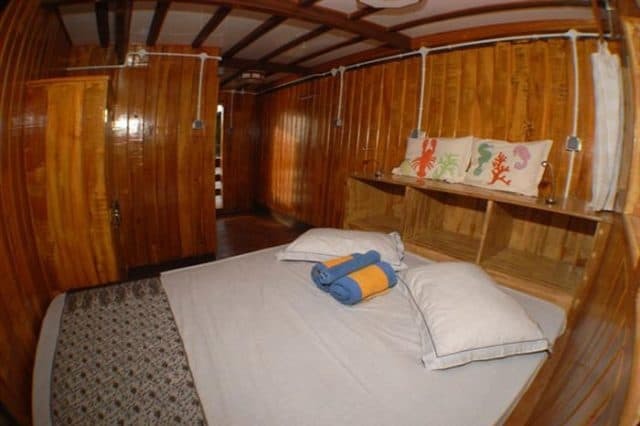 Also, at the aft of the upper deck, so right above the dive deck, you’ll find what they call a “chill out area“. Indeed, this lounge is just one more comfortable space where you can relax and take in the ever-changing views of beautiful Indonesia. The KLM Sunshine is a rather spacious vessel considering it welcomes only 8 divers. It’s hard not to compare it with it’s counterpart which offers scuba diving cruises in nearby Raja Ampat. Indeed, the Raja Ampat Aggressor is also 30 meters in length but welcomes the double number of guests and still is considered spacious! The renowned Blue Bay Divers Fleet didn’t leave anything to chance. The most discerning scuba divers will be pleased with the diving platform. Indeed, the sizable space located at the aft boast plenty of storage, camera stations and conveniently place rinse tanks. The KLM Sunshine is also assisted by a spacious dive tender. 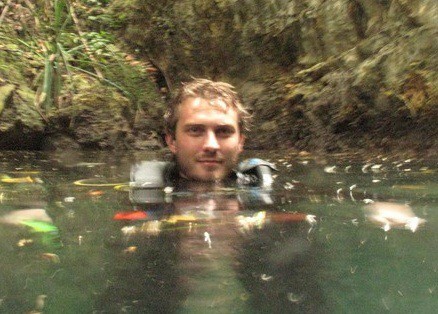 It’s very convenient to facilitate the reach of some amazing dive spots. Finally, it’s a highly competent and experienced crew that will take care of 8 lucky divers for a whole week, or more, of incredible diving in Indonesia. 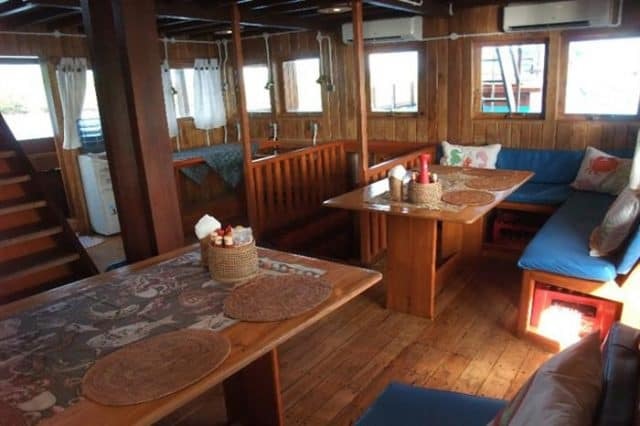 If you have been diving on board this liveaboard dive boat in Bunaken, Manado & Indonesia & Lembeh Strait & Sulawesi, please share your review and let us know what you thought. Please post your comments in the review section below, by doing so you will help fellow divers to plan their next diving trip . No Liveaboard Review yet on this page, please comment if you have been on the KLM Sunshine cruise. Heading to North Sulawesi ? Looking for a charter boat, or some uncrowded diving... you might have found just the right boat, the Sunshine!